1Department of Materials Science, Graduate School of Engineering, Osaka Prefecture University, Sakai, Japan; 2Ohcera Co. Ltd., Osaka, Japan; 3Institute for Chemical Research, Kyoto University, Kyoto, Japan. Copyright © 2013 Masahiro Fukuda et al. This is an open access article distributed under the Creative Commons Attribution License, which permits unrestricted use, distribution, and reproduction in any medium, provided the original work is properly cited. Solid solutions of (1 − x)Al2TiO5-xMgTi2O5 (x = 0 - 1) doped with alkaline feldspar were prepared. Thermal decomposition largely depends on the feldspar doping as same as the x value. It was found that decomposition free ceramics over 500 hours of heat treatment at 1100˚C in an ambient atmosphere could be obtained for the feldspar-doped ceramics at x > 0.5 with a fracture strength of 33 - 40 MPa and coefficient of thermal expansion of 2.4 - 4.1 × 10−6 K−1. A partial decomposition was observed for a compositional range of around x = 0.75. Both composition of the solid solution and an addition of the alkaline feldspar contributed synergistically to improve such thermal and mechanical properties. The decomposition free Al2TiO5-MgTi2O5 ceramics is expected for variety of high temperature applications including diesel particulate filters. Most of ceramics for high temperature applications such as refractory, ceramics filters and so on are damaged by a rapid temperature change, which largely reduces the usability and productivity because the heating and cooling rate should be less than the critical heating/cooling rates of the thermal shock . In general, it takes several to tens hours just for setting the furnaces/device to required temperatures. Different degree of thermal expansion along with the thermal gradient in the ceramics causes such thermal shocks, therefore low-expansion ceramics are widely studied to reduce the energy usages and to improve the productivity. Aluminum titanate (AT) ceramic is known to be an excellent thermal shock resistant ceramics . Therefore, many applications as refractory materials have been expected for the AT ceramics. The use of AT ceramics as refractory is, however, restricted because of the low fracture strength and thermal decomposition in the temperature range from 800˚C to 1280˚C. Many attempts to improve the thermal stability have been made so far [3-13]. The present authors have reported that the AT ceramics doped with alkali feldspar ((Nay,K1−y)AlSi3O8, y = 0.5 - 0.8) exhibited not only low thermal expansion coefficient comparable to non-doped AT ceramics but also high thermal stability, high refractoriness, and relatively large fracture strength . However, even with the feldspar-doped AT ceramics, prolonged thermal treatment at decomposition temperature range over several hundred hours results in the complete degradation into alumina and titania. It is reported that MgTi2O5 (MT) shows excellent resistivity to the thermal decompositions . However, its thermal expansion coefficient is reported as ~5 × 10−6 K−1, which is much larger than AT ceramics. Attempt was made to reduce the thermal expansion coefficient without a lack of its thermal stability by a formation of AT-MT solid solutions [16-20]. Hereafter, AT-MT ceramic is abbreviated as MAT in this article. Prolonged heat treatment for over several hundred hours at 1200˚C - 1400˚C eventually induces complete decomposition of MAT ceramics. Accordingly, decomposition free MAT ceramics with low thermal expansion coefficient and high mechanical strength have been strongly desired. In the present study, the structure and properties of the feldspar-doped MAT ceramics were investigated. The effects of the feldspar addition on the improvement of mechanical strength and thermal stability are discussed. Starting oxide powders of MgCO3 (Kamishima, Japan), TiO2 (rutile, Sakai Kagaku, Japan) and Al2O3 (corundum, Sumitomo Chemical, Japan) were weighed in a molar ratio of (1 − x)Al2TiO5-xMgTi2O5 (x = 0 - 1) and 4 wt% of alkali feldspar (Fukushima Choseki, Japan) was added to the mixture. The chemical composition of alkali feldspar used in the present study was analyzed as (Na0.6,K0.4) AlSi3O8 by fluorescence X-ray analysis (Rigaku ZSX- 100e, Rh source). Hereafter, (1 − x)Al2TiO5-xMgTi2O5 is abbreviated to MAT100x (x value in %, indicating a fraction of MT component) and feldspar-doped MAT ceramics is to f-MAT100x. For example, f-MAT25 indicates the ceramics of feldspar-doped 0.75Al2TiO5- 0.25MgTi2O5 composition. Alkali feldspar is simply called feldspar for convenience. The mixture of the starting reagents with 0.5 wt% peptizer Aron A-6114 (Toa Gosei, Japan) and 30 wt% water was put into the alumina pot with alumina balls, and mixed for 5 hours by using a planetary mill (Fritsch Pulversette 5, Germany). After being dried, the mixture with 10 wt% of a binder M30 (Kyoeisha Kagaku, Japan) was molded into 10 ´ 10 ´ 40 mm shape under a pressure of 60 MPa and subjected to drying at 180˚C for 2 hours. The molded samples were calcined at 340˚C for 4 hours and successively at 700˚C for 2 hours to remove organic matters completely. Then, the samples were sintered at 1500˚C for 2 hours to form MAT ceramics. A degree of decomposition was estimated by the method reported in Ref. . SEM-EDX analysis of f-MAT75 was carried out with JEOL 6500F with 15 kV acceleration voltage. Three point flexure strengths of the MAT and f-MAT ceramics were evaluated with Minerva TG-10kN testing machine according to JIS-1601. The values are estimated by averaging five measurements. Experiment error was estimated below 10%. Porosities were estimated by a conventional Archimedian method according to JIS R2205-74. Kerosene was used as a liquid media. The values were estimated by averaging three measurements and error was estimated below 5%. Thermal expansion coefficients (CTE) of the ceramics were measured by a thermal mechanical analysis equipment (Rigaku TMA 8227, Japan). CTE value was estimated from a difference of sample length at 20˚C and 800˚C. Formation temperatures of MAT0, MAT50, f-MAT0 and f-MAT50 were measured with differential scanning calorimeter (Rigaku DSC 8270, Japan). Figure 1. X-ray diffraction pattern of MAT50 and f-MAT. in all the prepared ceramics are assigned to MAT with a pseudo-brookite structure (space group Cmnm) [14,16]. 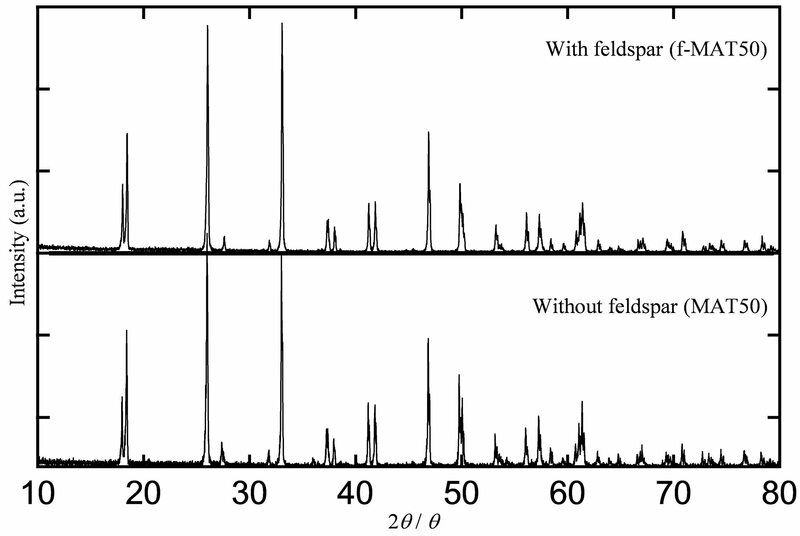 Small diffractions due to corundum impurity were observed in the XRD spectra for all the ceramics obtained. Coefficient of thermal expansion (CTE) from 30˚C to 800˚C, fracture strength estimated by 3-point bending test, porosity, and AT-MT formation temperature of the representative compositions are summarized in Table 1. Although CTEs are independent of feldspar doping, fracture strength and porosity largely depends on the doping; fracture strength increased almost twice and porosity decreased. It has been reported that the formation temperature of AT phase is decreased by the feldspar-addition , which is also shown in Table 1. It was explained that the decrease of the formation temperature is due to the entropic contribution by the existence of liquid phase feldspar at the formation temperature range, resulting in the denser and thermally stable AT ceramics formation through a liquid phase sintering. On the other hand, formation temperatures of MAT50 and f-MAT50 ceramics are almost identical irrespective of the feldspar addition. This is explained by that the formation temperature of MAT50 ceramics (~1225˚C) is closer to the melting temperature of the feldspar (1130˚C) than that of AT ceramics. Therefore, the effect of the liquid phase sintering for f-MAT ceramics would be less than that of feldspar-doped AT ceramics. This is in consistent with that the decrease of porosity of the f-MAT ceramics for higher MT ratios is less than that for lower MT rations. Table 1. Compositional dependence of CTE, fracture strength, and porosity of AT-MT ceramics. Figure 2. Degree of decomposition of MAT ceramics with and without feldspar addition after heat treated at 1100˚C for 500 hours. feldspar addition) showed almost complete decomposition below x = 0.8 (MAT80). 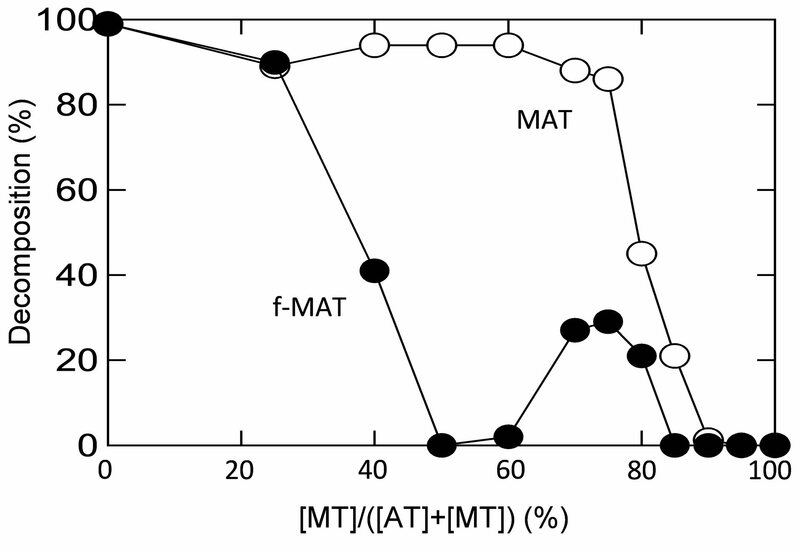 On the other hand, f-MAT ceramics of large MT ratio beyond x = 0.5 (MAT50) exhibited excellent thermal stability against the heat treatment. A partial decomposition was observed around f-MAT75. However, even f-MAT75 ceramics remain 70% of its original phase by the heat treatment. We do not have clear explanation on this behavior; however it may be explained by that the decomposition around f-MAT75 composition is due to the cation site order-disorder. It has been reported that the cation ordering among two kinds of cation sites in pseudobrookite structure is related to the mechanical and thermal properties. At the f-MAT75 composition, exactly a half of the cation site is occupied by Al ions. The compositional regularity may affect the site ordering and also entropic stabilization. At larger MT ratio, a decrease of the formation temperature reduces the upper limit of the decomposition temperature range. Beyond x = 0.85, the ceramics exhibited excellent thermal stabilities irrespective of the feldspar addition. On the other hand, at medium composition range from x = 0.5 to x = 0.85, the thermal stability was improved a lot by the feldspar addition. 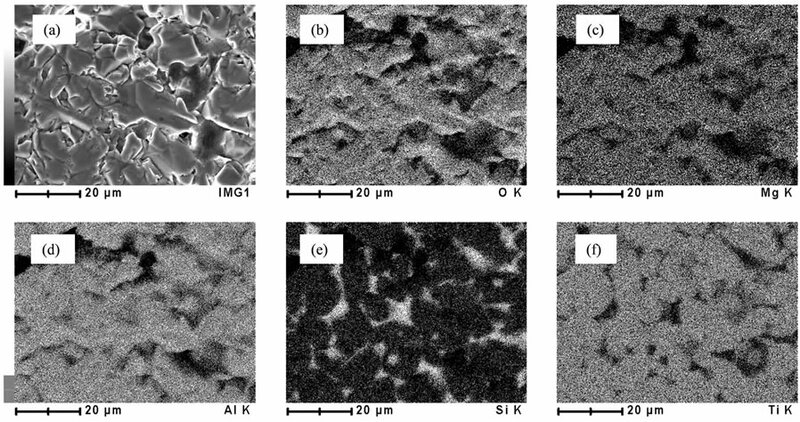 Figure 3 shows the SEM-EDX images of fractured surface of f-MAT75 ceramics. It is found that the Si accommodated in the triangular points of the ceramics grains or grain boundaries. The existence of the glassy phase on the surface of grains may reduce the nucleation of alumina at the grain boundaries which reduces the thermal decomposition of f-MAT ceramics with larger MT ratios. This is the most plausible explanation of the improved thermal stability of the f-MAT ceramics. The existence of the glassy phase also contributes reduce the pore volume and to the improved mechanical properties of f-MAT ceramics. Figure 3. SEM-EDX images of fraction surface of f-MAT75 ceramics (a) SEM image; EDX mapping image for (b) O; (c) Mg; (d) Al; (e) Si; and (f) Ti (white: larger amount of the element). stability was realized. The thermal expansion coefficient of these ceramics were low enough comparable to that of AT ceramics. The mechanical properties are also improved by the feldspar addition. E. Kato, K. Daimon and Y. Kobayashi, “Factors Affecting Decomposition Rate of Al2TiO5,” Yogyo-Kyokai-Shi (Journal of the Ceramic Society of Japan), Vol. 86, 1978, pp. 626-631. I. J. Kim and L. J. Gauckler, “Excellent Thermal Shock Resistant Materials with Low Thermal Expansion Coefficients,” Journal of Ceramics Processing Research, Vol. 9, 2008, pp. 240-245.